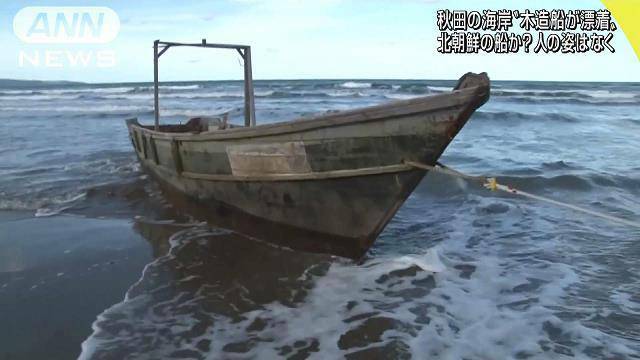 AKITA (TR) – Japan Coast Guard officials believe an unmanned wooden boat found washed ashore in Oga City on Saturday possibly originated from North Korea, reports TV Asahi (Nov. 18). At around 4:20 p.m., a person in a car spotted the craft — measuring 8.5 meters in length — drifting off shore. No persons were found in the area. According to the officials, hangul writing, which is the script of the Korean language, was found on the vessel. Last week, the government of Japan said that 89 such vessels washed shore in northern Japan through November 9, a figure that is on pace to exceed that for 2017.